This morning, Stats Canada released the first quarter GDP figures indicating a slowdown in growth in the first quarter to a 1.3% annual rate compared to 1.7% in the final quarter of last year. This was precisely what the Bank of Canada (BoC) forecast for Q1 in the April Monetary Policy Report (MPR). Yesterday, the BoC told us in its press release that the first quarter’s growth exceeded their expectations. Most economists were expecting first-quarter growth to come in at 1.8%, and so was the BoC. Only goes to show that not even the central bank has a crystal ball. Growth was dampened by a deceleration in household spending, lower exports of non-energy products and a decline in housing investment. Consumer spending decelerated for the third consecutive quarter–rising by 1.1% in Q1 compared to 2.2% last quarter. The growth in consumption peaked in the first quarter of last year at a robust 4.0% annual rate. Household spending growth has decelerated to its slowest pace in three years. Consumer spending on goods such as automobiles stalled after almost three years of gains. Growth in business spending on capital projects slowed to 3.5% from 9.7% in the final period of last year, and foreign trade was a drag on growth as exports climbed less than imports. The most significant decline was in housing. 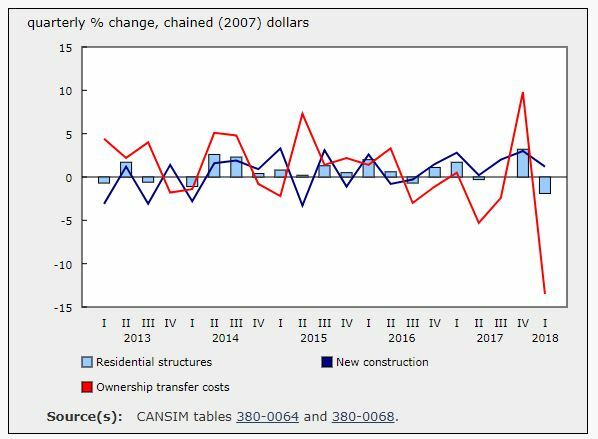 Investment in housing fell 7.2%, the most since 2009, on a whopping 13.5% plunge in ownership transfer costs such as real estate and mortgage broker commissions (see chart). That reflected new mortgage stress test measures that began in January, Statistics Canada said. On the positive side, the quarter ended with a monthly output gain of 0.3% for March, led once again by a 1.9% rise in mining, quarrying and oil and gas extraction. However, the monthly industry-level data showed the biggest plunge in the output of housing-related brokers since the first quarter of 2008 when the global economy was mired in financial crisis. This, of course, was the intentional result of government and regulatory efforts to slow the housing market. The pace of economic expansion in Canada has now been below 2% for three consecutive quarters, the worst performance since the oil crash in mid-2015. 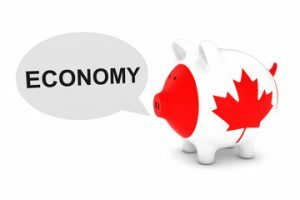 The economy had recovered with gains exceeding 4% in the first half of last year when Canada boasted the most robust economy in the G-7. In the first quarter of this year, while Canada’s economy grew at a 1.3% pace, the GDP growth in the United States was 2.2%. BoC Deputy Governor Leduc’s speech later today may give some hints about how today’s releases impact the Bank’s thinking, but in general, a July rate hike is still in play after yesterday’s no-change decision.